Great location. Well equipped , spacious accompanying. Friendly and helpful management. 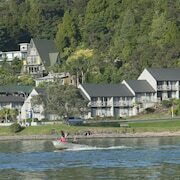 If you dream of hanging out in a little slice of paradise where fishing and sailing are all the rage, it’s time to plan a holiday to lovely Bay of Islands, New Zealand. This amazing destination boasts a natural harbour and 144 charming islands. You can plan a magical itinerary that includes stops at the Parrot Place, Rainbow Falls, and the Cape Brett Walkway. You’re also sure to love going back in time with visits to Rewa's Village, Saint James Anglican Church, and the Russell Museum. 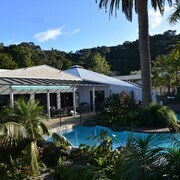 If you’re eager to embrace the lush greenery and marine creatures that bring Bay of Islands to life, the Aroha Island Ecological Centre is a sure bet. Of course, nobody would blame you if you made a plan to relax on the beach all day during your upcoming holiday. Many travellers come to this gorgeous spot to do a little snorkeling or scuba diving. The lovely landscape here is also peppered with some very inviting wineries and vineyards. 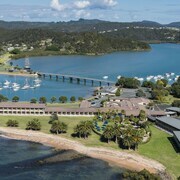 You’ll be happy to discover that there are many Bay of Islands hotels that offer exceptional views of the water. Take some time today to plan an amazing getaway that fits your budget. 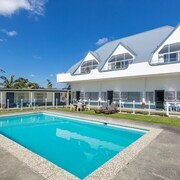 When it comes to finding a Bay of Islands accommodation, you can count on cheap deals from Expedia.co.nz to help you snag the best room at the best rate possible. 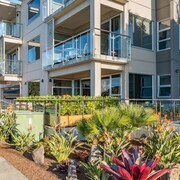 Whether you plan to stay in a lovely fishing village or near a sprawling vineyard, we’re here to make sure you get a dreamy view. What’s more, we give you the freedom to choose between luxurious resorts and family-friendly hotels. You never have to sacrifice between location and comfort again. 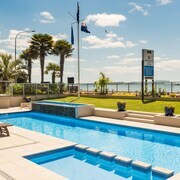 New Zealand’s semi–tropical maritime climate is a dream for anyone who loves a good holiday any time of year. In fact, it’s not uncommon for temperatures to climb up near 23 degrees Celsius here during the winter. The average daily temperature typically ranges between 15 and 28 degrees Celsius. If you’re looking for the easiest way to get to Bay of Islands, landing at Auckland Airport (AKL) is your best bet. Once you land, rent a car and relax as the rolling landscape of New Zealand passes by your window during your drive to your hotel. 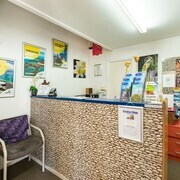 Here at Expedia.co.nz, we’re all about helping you get on a boat or surfboard for less money than you thought possible. Let us help you bounce on the warm, glistening waves of the Pacific Ocean during your next vacation with some great travel offers. 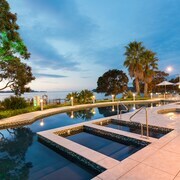 You can use our online booking technology to snag a luxury accommodation in Bay of Islands for the guaranteed best price around right now. In addition, you can add on a flight for just a little bit more to create an all-inclusive travel plan. 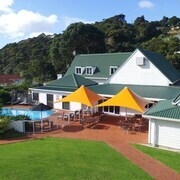 We’ll even help you save some serious dough on your Bay of Islands car rental. Are you ready to feel sunshine on your shoulders and more money in your wallet? Plan a sunny getaway using our legendary online deals today. 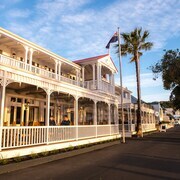 Explore Bay of Islands with Expedia.co.nz’s Travel Guides to find the best flights, cars, holiday packages and more!